One of the simplest yet most useful adjustment tools in photo editing is levels. Using levels to adjust the tonal range of an image will give you much more control compared to using the brightness/contrast adjustment. To be honest, I used brightness/contrast for years, totally ignorant of the existence of levels. When I discovered the dramatic impact of levels adjustment, I wanted to re-edit every single picture I had post-processed. What really gets to me is that it only takes a few seconds to change a dull and drab photo into a more attractive image. We have discussed the histogram in a previous article and here we will apply what we’ve learned. Open the levels screen. The location varies depending on what photo editing program you use. For Adobe Photoshop, it can be found under Image, then Adjustments. 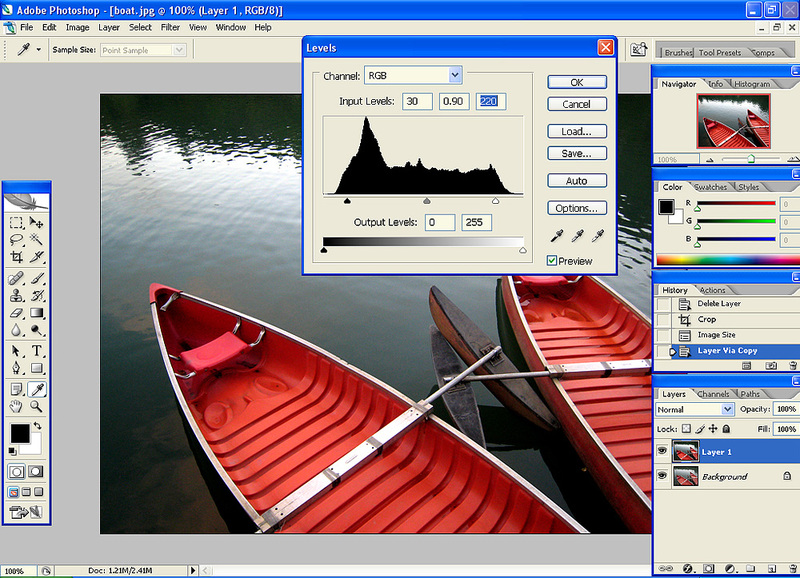 The levels screen will show the histogram, which is a graph that shows the brightness of an image. Using the histogram as a guide, you can gauge whether the image is evenly lighted or over or underexposed. To adjust the levels, slide the triangles toward the center, the distance depending on how dark or light you want the image to become. The left black slider will darken the overall image while the right white slider will brighten it. Usually the sliders are moved to the edges of the histogram. The closer the sliders are moved to the center, the more severe the contrast. The middle gray slider adjusts the level of brightness or darkness of the midtones of the image. The photo comparison above shows the difference in tonal contrast between the original image and the edited copy using the levels adjustment tool. The reds have become more vivid and bright and the reflection of the trees in the water appears darker. The levels adjustment can also be used to lessen contrast in case your image appears to have too much. This is done by tweaking the output levels (that bar below the histogram). This entry was posted on Thursday, October 28th, 2010 at 9:50 am	and is filed under Articles, Photography Basics, Photography Techniques, Photography Tutorials, Photoshop Tutorials. You can follow any responses to this entry through the RSS 2.0 feed. You can leave a response, or trackback from your own site.